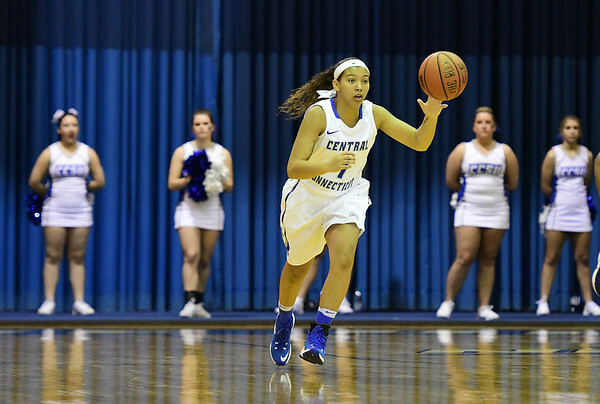 LORETTO- Despite opening the game with an 8-0 run, the CCSU women’s basketball team fell 83-68 to Saint Francis on Saturday, snapping the team’s two game winning streak. The Blue Devils held the Red Flash scoreless through the first 3:52 of the game, forcing Saint Francis’ shooters to just a 1-for-7 clip from the field in the early going. Courtney Zecca and Jess Kovatch awakened the Red Flash offense by combining for 14 points in the first quarter, giving Saint Francis the lead. Kiana Patterson knocked down four 3-pointers in the opening half and began the second half with another three, helping the Blue Devils shoot 4-for-5 out of the halftime break and cut the deficit to two. After a Saint Francis timeout, the Red Flash once again awoke for a run, outscoring CCSU 15-7 for the remainder of the period. Saint Francis would stretch the lead to as much as 16 in the fourth quarter, and while Sydney Hines helped cut it to nine behind a pair of 3-pointers, nine was as close as they would get. Patterson finished with 15 points, the only Blue Devil to finish in double figures. Kovatch finished with 28 for Saint Francis. Posted in Newington Town Crier, CCSU on Saturday, 9 February 2019 21:38. Updated: Saturday, 9 February 2019 21:41.